The author taking in the wonders of the forest. I’ve hiked the trails behind my house, part of the Mink Brook Nature Preserve, a handful of times since my husband Roy and I moved to New Hampshire a year ago so Roy could attend the business school at Dartmouth College. But those walks were always with Roy and the dog in tow, where we could simultaneously get some exercise and discuss the list of projects we were working on — his green card application, my querying literary agents, moving to another part of the country for his summer internship and so on. But on this particularly beautiful clear spring day before a two-week bout of rain, I’m wandering around the woods off-trail with something else in mind entirely: forest bathing. 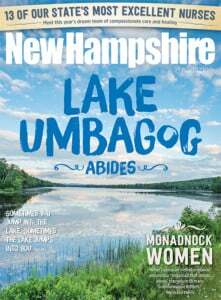 New Hampshire is arguably one of the best places in the world to engage in Shinrin-yoku, a term coined by the Japanese Ministry of Agriculture, Forestry and Fisheries in the 1980s that has become known in translation as forest bathing. After talking to several practitioners and fans, I’ve come to understand that it essentially means wandering slowly around a natural environment replete with trees, soaking in the forest air and observing the atmosphere around you. But scientists are now trying to pinpoint the positive effects of being in nature and understand the mechanisms that drive them. In recent years, Japanese researchers have demonstrated that walking in the forest can lower levels of cortisol, a hormone that is associated with stress; lower our heart rates and blood pressure; increase parasympathetic nervous system activity, which is associated with relaxation; and reduce sympathetic nervous system activity, which is associated with stress and the famous “fight or flight” response. Other experts highlight the olfactory benefits of walking near trees. Studies have shown for example, that phytoncides — antimicrobial compounds released into the air from plants and trees like the Hinoki cypress — can lead to decreased levels of stress hormones and increased natural killer cells, which boost our immune system and help fight off tumors and viruses. Gregory Bratman, a postdoctoral research fellow at Stanford, conducted two studies in which students walked in either a nature environment or more urban one. “We tested their mood, cognitive function and a particular aspect of their emotion regulation known as rumination, which can be summarized as a tendency to engage in repetitive thoughts focused on negative aspects of yourself. And in these experiments, we observed a benefit of nature versus the urban experience across those aspects of psychological well-being,” he says. Bratman says that two known concepts, attention restoration theory and stress reduction theory, might help explain the results. For me, the notion of “attention restoration” and the idea that nature engages indirect attention, allowing direct attention capacity a chance to replenish, rings particularly true. When I walked into the woods without my devices, determined to do nothing but focus on the environment around me, I noticed the bark on some trees was peeling back horizontally instead of cracking vertically and stopped to examine the texture more closely. I found myself wondering how I had never noticed that trees peel horizontally like this. And had trees always shed? I took time to look at the light coming through the trees and the patterns it made on the shaded floor. I listened to the sounds of chirping, gurgling and cackling birds coming from all directions and was impressed by how diverse the sounds were. But as soon as I walked back to the parking lot, the low buzz of the forest immediately gave way to more direct concerns — a dog was off-leash near a car and barking at me, and nearby, where a maintenance man was taking equipment out of his van, the rumble of the van door was louder and felt more threatening than anything in the forest had. All this scientific research on the benefits of nature may be bringing its importance to the fore. “Forest bathing” has entered our lexicon, for one, and the practice seems to be catching on around the United States and abroad, with some people having already come up with their own guidelines for how to best experience the forest. Amos Clifford, the Association of Nature and Forest Therapy Guides founder who gave me the tip to leave my phone at home to forest bathe, has been training forest therapy guides — leaders who take individuals or groups out on walks — since 2014. So far, he has trained well over 100 people, ranging from naturalists and psychotherapists to combat veterans, and he’ll be training two physicians in forest therapy guiding this year. He says his training sessions, which take place all over the United States and in such countries as Ireland, Canada and New Zealand, now fill up before he can even promote them. While Clifford emphasizes that forest bathing can be done anywhere with plant life — he’s led walks in parks surrounded by freeways, for example — he says some of the best places for forest bathing are savanna-type landscapes: plains, forests, edge zones where the forest and plain meet, and other mixed zones. He recommends looking for diverse areas where there might be several types of characteristics, such as year-round water and both sun and shade. For beginners like me, Anderson suggests walking silently. “Simply notice everything around you,” she instructs. “Bring your attention back to the senses without judging yourself or anything else — just allow it to happen.” As for me, I plan to go again tomorrow.